A study of energy use in worship centers is presented along with recommendations for designing new buildings and improving existing buildings. This article describes experience with energy use in houses of worship. It presents metered energy data from 302 churches, synagogues, mosques, and other places of worship in and around Philadelphia. The buildings average 16,700 sq ft. Each building has its own utility meters and does not share fuel storage tanks with any other building. 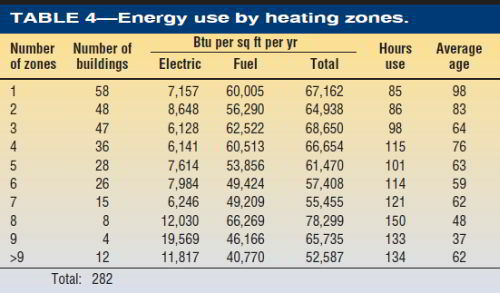 The average energy budget is 64,400 Btu and $0.7 per sq ft per yr. The Interfaith Coalition on Energy (ICE) was started in 1980 by the religious community in Philadelphia, with financial support from foundations and corporations. During the past few years, ICE has continued its work with support from local religious denominations and from fees for service, mostly on-site surveys of the buildings and their energy systems. Data from each separately metered building are entered into a database. This article is based on those data. An earlier summary was published in February 1988 To date, ICE has conducted onsite energy surveys for over 460 congregations with over 1100 buildings. It has published more than 60 newsletters and conducted over 200 energy management workshops. When a congregation expresses interest in an ICE energy survey, it must first sign forms to authorize the release of information about its energy consumption. 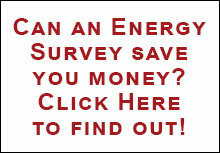 Energy data are gathered from the utilities and fuel suppliers before each survey. After the survey report has been completed, the energy data, as well as data from direct observation of the building and its energy systems, are entered into a relational database. The age and type of building are two of the data fields. For this article, the database was separated by age into seven groups of 34 to 54 worship centers. The age groups were selected to get about the same number of buildings in each group. Worship centers are defined as buildings that contain a worship space that is used once or more weekly. The building may also contain offices and classrooms. In many buildings, the classrooms are used for child care during the week. These 302 worship centers are fairly similar. For the entire group of worship centers, the average cost of energy is $0.69 per hundred cu ft of natural gas, $0.97 per gal of No. 2 fuel oil, and $0.13 per KWH. The high cost per kilowatt-hour is attributable to the electric demand cost in buildings with relatively low hours use. Many of these buildings have an off-peak electric rate with reduced demand charges. Without the off-peak rate, electric cost would be even higher. In each age group, the use of the buildings is about the same. The use of the buildings has been estimated by calculating the hours use of peak monthly electric demand. For buildings with measured demand, the monthly kilowatt-hours are divided by the monthly peak measured demand in kilowatts, resulting in the hours use of demand. The 12 months of hours use are average for the year and entered into the database. The averag hours use of demand for all 302 worship centers is 119, or almost 30 hr per week. Newer buildings have slightly more hours use. Overall, newer buildings use less fuel per square foot than older buildings, and the newest buildings use the least of all. 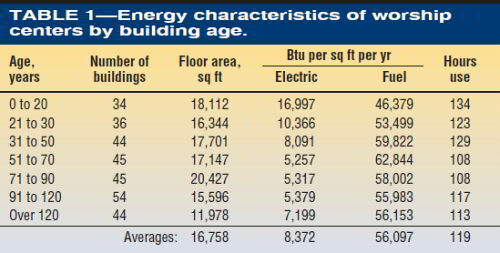 For buildings older than 20 years, the annual fuel cost per square foot varies between $0.39 and $0.46. For those newer than 20 years, the annual fuel cost averages $0.32 per sq ft. Similarly, the proportions o fuel costs of total energy costs is about one-third for buildings newer than 20 years and one-half to two thirds for those that are older. Most buildings over 20 years old have little or no insulation. Thus, newer insulate buildings are saving $0.07 to $0.14 per sq ft per yr.
systems use 53,678 Btu per sq ft. 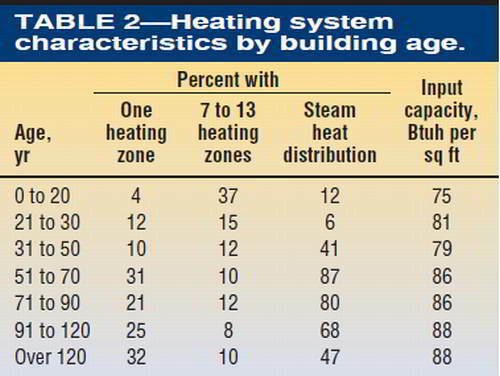 The higher energy use for steam systems is probably caused by greater heat losses. 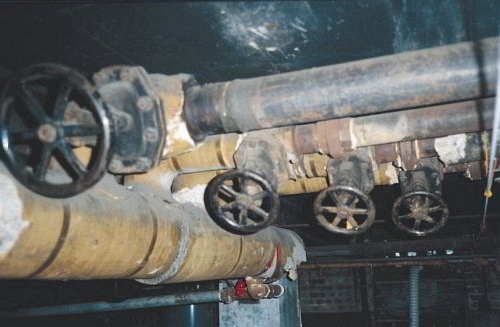 Electric use in steam heated buildings is lower since fans and pumps are not usually used. Note that installed capacity is usually more than twice the design heat loss. About one-quarter of older worship centers have a single heating zone. One in ten have 7 to 13 zones. The ratios reverse for newer buildings. More than half the worship centers over 30 years old have steam heat. Only one in ten newer than 30 years old has steam heat. 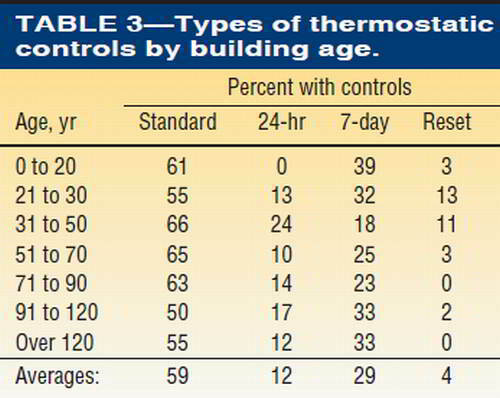 In all age groups, over half the buildings control space temperature with standard, non-timed (non-setback) thermostats. One quarter to one-third use temperature controls with a timed 7-day cycle. About one in eight uses 24-hr clock thermostats. In worship centers less than 2 years old, there were no 24-hr clock thermostats. In the 302 buildings, there were two energy management systems. About 4 percent of these worship centers have outdoor reset controls that cycle burners for steam or modulate the temperature of circulating hot water in proportion to outside temperature. In almost every instance, these controls are either disconnected or pinned to their maximum settings. Based on conversation with building operators, these controls clearly restrict the ability of the boilers to recover quickly from low temperatures during unoccupied times. Reset controls are most common in worship center between 20 and 50 years old. Newer buildings are more likely to have air conditioning. Two-thirds of the 98 worship centers that are over 90 years old have no air conditioning. One in eight have central air conditioning. Only 10 percent of the newest worship centers do not have air conditioning, and 70 percent of the systems are central. As air conditioning becomes more prevalent in newer worship centers, the peak electric demand …….